We saw in an earlier post that RLS was so struck by a painting by Manet that he probably contemplated spending all the money he had in order to buy it. We know that he was very impressed by Millet’s Realist Homme à la houe when he saw it in an etching (L4: 62, 72). 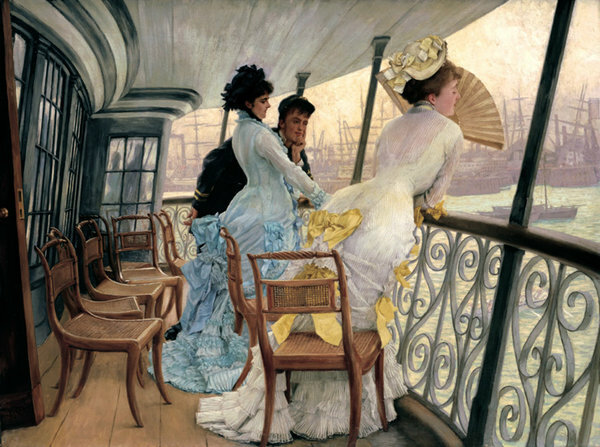 Another and very different painter that interested him (or who at least he defended) was James Tissot. Returning to foreign contributors, we have in M. Tissot another craftsman of astonishing industry and cleverness, and a realist who, instead of adding a grace to nature, takes a grace away. In pictures like the group of cricketers and ladies beside the water under a horse-chestnut [‘Holiday‘], and the naval lieutenant and ladies on the gallery of a ship of war [‘The Gallery of H.M.S. Calcutta’], the rendering of material facts, is simply masterly; the types and sentiment simply debased and odious. 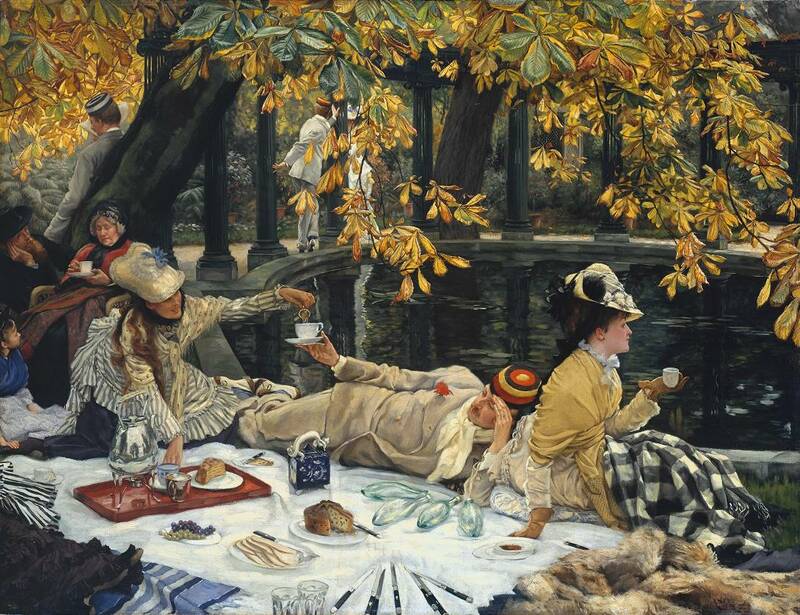 To this mean view of human nature, M. Tissot adds in some of his pictures a trick of Alma-Tadema’s, of crotchety and sensational composition, of showing the world from unnecessary slits and corners. I think Tissot is the worst and most meaningless of all. I suppose his is what Ruskin would call contemplative art. And what are the highest things of which M. Tissot is contemplative? A girl’s ankles, the high heels of her shoes, the frills of a fashionable petticoat, and the amount of back that she can show through muslin, between her stays and her neckline’ (‘A Familiar Colloquy’, Nineteenth Century 4:18 (Aug. 1878), p. 291). In ‘A Note on Realism’, RLS places ‘ideal’ and ‘abstract’ in the same area of meaning (and associated with concision in expression and the use of details ‘of the conventional order’), and opposed to ‘realism’. However, he says ‘All representative art, which can be said to live, is both realistic and ideal’. So in his reply to Colvin we might say that he is identifying, in Tissot’s realism, a ‘sort of idealism’—which I personally would see as something like ‘interest in artistic form for its own sake’. In the same ‘Note on Realism’ he does not oppose a Platonic ‘essence’ and a less interesting outer form, but sees this outer form as the whole work of art (apart from the initial but incommunicable concept). He does not condemn ‘facturing’ unless it is merely an excuse for the display of technical skill—but in the case of Tissot and Manet he accepts it as contributing to ‘ideal’ aspects of the work of art. And in his reply to Colvin he is not opposed to a highly-finished technique for reproducing ‘light and air’ since this is also an ‘ideal’, i.e. not merely realistic, but an abstract and ideal-driven project. However, we await a full study of ‘the aesthetics of Robert Louis Stevenson’ in order to understand these matters better.